An ex-con is facing a battery charge after he struck a Walmart employee in the face with a bag of potato chips during an argument with the victim, according to Florida police. 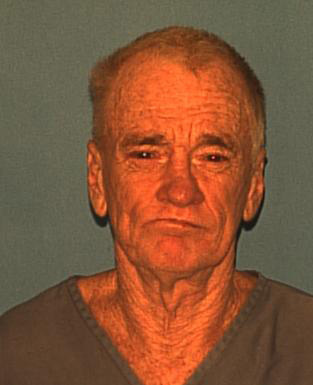 James Robertson, 61, was busted Wednesday morning following a confrontation with a female staffer at a Walmart in Gainesville. Cops say that Robertson, seen at right, “engaged in a verbal argument” with worker Tara Haynes over her refusal “to make a sale to him.” After Haynes asked Robertson to leave the store, he allegedly “took a bag of chips he was attempting to buy and threw it at” the Walmart employee. The potato chips, police noted, struck Haynes "in the face and upper chest," though she was not injured by the flying snacks. Robertson, charged with misdemeanor battery, was freed on his own recognizance after being booked into the county jail on the misdemeanor rap. As part of his release conditions, Robertson has been barred from returning to Walmart. According to court and state prison records, Robertson is a convicted felon whose rap sheet includes arrests for escape, battery, loitering, trespass, battery on a law enforcement officer, and criminal mischief.